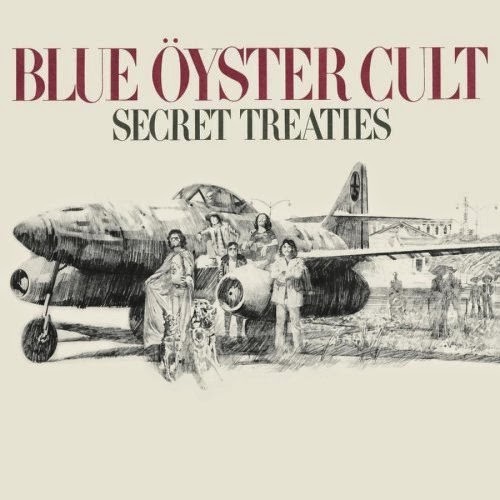 The third studio album from New York's Blue Öyster Cult, Secret Treaties is an accomplished hard rock collection pushed into metal territory by clever aggression and complex arrangements. Drinking deeply from the era's evolutionary turmoil between the purple haze of the late sixties and before punk and disco sharpened the opposing cultural forces of the seventies, the band's sound rides on Allen Lanier's keyboards, and the album is at its best when Lanier weaves a carpet of magic for the rest of the band to ride on. Opener Career Of Evil (with lyrics by Patti Smith) is a prime example, the song a soaring model of keyboard-enhanced metal. The intro to Subhuman emphasizes the point, while the subsequent instrumental interlude enjoys some brilliant interplay between keyboard and guitar. Secret Treaties also features plenty of insanely enjoyable let-loose moments. The final minute of the frantic Dominance And Submission rocks out with Donald Roeser's nimble guitar charging into battle, while Harvester Of Eyes is a bluesy romp encouragingly nudged into the metal age. Cagey Cretins is an unfortunate throwaway track, but the rest of the album is filled with attractive harmonies, swirling arrangements appealing to the psychedelia crowd, and a seemingly endless capacity to explore always interesting new territory within the bounds of classy energy. Produced by Murray Krugman and Sandy Pearlman. Engineered by Tim Geelan. Recorded by Lehman Yates and Lou Schlossberg.